alleviate her wrist pain. The acetaminophen has provided only mild and inconsistent improvement of her pain. She denies smoking cigarettes but does admit to drinking a glass of wine on occasion. She does not use any illicit drugs. On physical examination, the patient is not in any apparent discomfort. Her oral temperature was 96.3°F (35.7°C). Her pulse has a regular sinus rhythm, with a rate of 88 bpm. Her blood pressure is measured at 145/75 mm Hg. No skin rash or discoloration is noted. Her head and neck examination is unremarkable. Her lungs are clear to auscultation, with normal respiratory effort. Her abdomen is soft and nontender to deep palpation. There is no evidence of organomegaly. The patient's reflexes are normal and symmetrical. Close examination of her right wrist shows mild but definite soft-tissue swelling just proximal and posterior to the radial styloid. There is no associated erythema over the area of pain, and no pain is elicited on palpation. There is exquisite pain at the thumb with the Finkelstein maneuver (a specific maneuver in which the thumb is placed in the closed fist and the affected hand is tilted towards the little finger, into ulnar deviation). Her laboratory workup includes a complete blood count, with normal red and white blood cell counts and no thrombocytopenia. The erythrocyte sedimentation rate (ESR) is mildly elevated. Her basic metabolic panel is normal. Her serum rheumatoid factor is within normal limits. The antinuclear antibodies (ANA) are within the normal range. Radiographs of the right wrist fail to reveal any bony abnormalities. 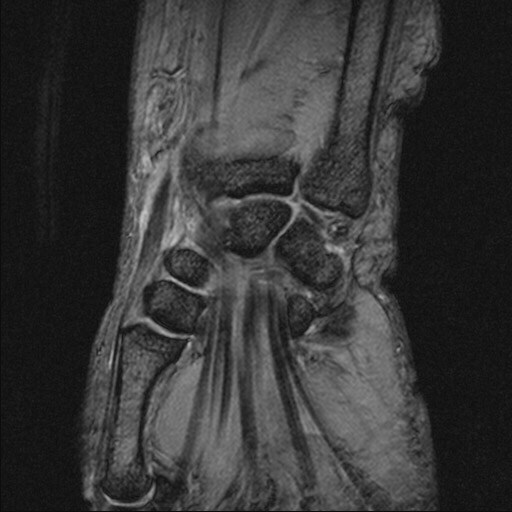 A magnetic resonance imaging (MRI) scan of her affected wrist is performed (see Figure 1). Hint: The condition is caused by overuse, classically among mothers of infants repetitively picking up their children.